After local news reports revealed the existence of Gill Girls and Congress received whistleblower emails from an unnamed ACS staff person confirming the illegal experiments by the CIA black ops subsidiary, G-Unit Agent Milo Finn was assigned to the case to perform an oversight investigation. Project Sherwood (Case File 5F-05) had concerned Congress for some time as it was the original set of experiments sanctioned by ACS Director Smalls that dealt with mutated human/amphibian female hybrids. Smalls argued that his scientists did not create the creatures, but were merely examining those that M-Agents had captured in the swamplands. He indicated that Prof. Lamb was attempting to extract vital DNA agents from their bodies that could be used for future military purposes. As Director Smalls saw it, these actions were perfectly within the established governance rules under ACS/M-Division's charter. Congress disagreed and cut their funding. The new Project Greenleaf was considered an intentional breach of contract by Director Smalls and his organization. Restarting Gill Girl experiments without approval was just another recent decision by ACS/M-Division that disagreed with the wishes of CIA Proper. 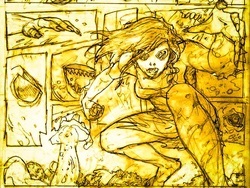 During his investigation, Agent Finn specifically discovered the illegal interrogation, severe torture, and invasive experimentation on the captured Gill Girl Carolyn Bronnicke; and further unearthed a slew of additional experiment atrocities that Director Smalls and his science team had been conducting. After four infected female civilians were brutally murdered by M-Agents, Agent Finn helped free Carolyn, the lone surviving Gill Girl from ACS/M-Division and Project Greenleaf was shut down. Since that time, Carolyn has been under the care of a G-Unit medical team that is researching her condition.